Okay, technically and in the interest of honesty, I was not actually kicked out, but I was certainly made to feel unwelcome. Here goes. I like writing in the library as going somewhere to write always makes me feel like I am going to a job and I focus better on the task at hand. As well there is a particular library that I like to go to as it has wonderful architecture with lots of natural light and is spacious inside. I can go up to the top and be left alone as I plug in and write until the library closes. For me it is great. Treabilla’s service took much quicker than I had expected and so I was available to head over to my favourite library so I could write there all day. They don’t open till 10:00 AM and I was ready to go by about 8:15 I decided to go to the library and just wait, why not. The library opened up at 10:00 and in the meantime I blogged, my day was starting well, it was going good. Around about lunch time I was getting hungry and I had finished my first chapter, so I decided to go out and have a bit of lunch. So I did. When I finished lunch and was about to head back, I noticed this under Trea’s windshield wiper. Yes, I censored it as this is about how I reacted to it and how it made me feel. The note seemed to insinuate that I had been there all night and how dare I do such a thing. I don’t mind being called on stuff that I have actually done, but I hate being accused of stuff I haven’t done. So I went inside to talk to whoever left this note and let them know that I was in fact here only when I was using the library. Not long after showing the note to the librarian at the counter (I was polite) I ended up talking to, whom I assume was the manager. They never introduced themselves, so I am only left to guess. Their attitude was one of 'why are we talking' and they started out the conversation with “I haven’t called the tow-truck . . . yet.” Even after I assured them that I was only here when I used the library this did not help. They retorted that they had no way to know that and I was there before they opened so they assumed that I was one of the people who left their vehicles over the weekend. Apparently your local library views vehicles like unattended packages at the airport . . . they don’t mess around. They told me that I took up six of their spaces and if I parked on the other side of the shopping centre lot it might be okay. This library is located on a lot which is attached to a major shopping centre. The reason I don’t park in the shopping centre lot is that I want to be closer to the library so when I come out for lunch I am not walking for ten minutes just to get to where I park. I know it is not proper for me to park too close to the door, so I park in the most distant end of whatever parking lot I am in. Also there is the little detail of parking in a shopping centre lot that I am not patronizing. (Trust me, I patronize Walmart). There was no apology but I was told that I was welcome to stay at the library. I decided to leave as I felt that this was something they were legally required to say. I left and needed a coffee to calm down and decide what to do next. I was insulted at how I was singled out due to the size of my vehicle and assumed that I had been there all night when I have never done so before. I was always polite and never have caused any fuss inside the library. The closest was the first time I was leaving at the time they close (when they say they are closed that means they are locking the door . . . they’re not kidding). I went to another library and that one had horrific parking so I went to yet another one, that one was in a large strip mall so parking was not an issue. I was able to park in a dirt section of the parking lot and still use the library. It is essentially an unimaginative library in commercial space in a dreary little strip mall. The parking will not be an issue however, and that is important. 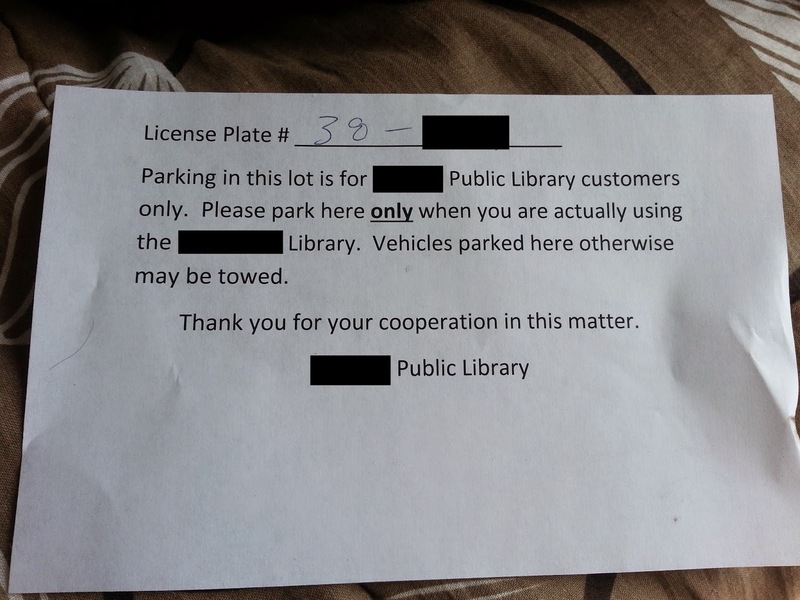 Call me crazy but I feel that my honour has been insulted by the other Library and I will not go back there, even if I was to park elsewhere and walk across the shopping mall parking lot. I was there at their lot for less than three hours, I can’t determine when this note was left but I am left to wonder if it was left as soon as they opened.